The ebook has five patterns — for an earflap hat if various sizes, knit toys, a baby hat, a little shawl and a garter stitch baby blanket — all of which are perfect little projects for comfort and warmth. Knit up some blankets for the local hospital, donate hats to the homeless, or knit prayer shawls for cancer patients. This ebook is available for free to members of the Knitting Daily community, which is free to join and includes a daily email about knitting. 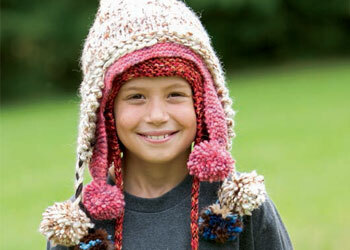 Do you like to knit for charity? I’d love to hear what you make! I lead a group of women, open to anyone, that create complete sets of cocoon, hat, sweater, booties, and some make mitts for the newborn babies at 2 hospitals in our area. I’m always looking for good patterns that go quickly to meat our need of up to 90 babies a month.